The mission of Holy Cross Dance Marathon is to give students and faculty the opportunity to share a remarkable dance experience with one another with the goal of raising awareness and funds for the Elizabeth Glaser Pediatric AIDS Foundation (EGPAF). Throughout the year, we strive to bring people together in unique and fun ways to inform and educate the community. The first annual Holy Cross Dance Marathon in January of 2012, with over 100 dancers, raised over $26,000 in the fight against pediatric HIV/AIDS. The number of both dancers and money raised has been growing substantially throughout the years. 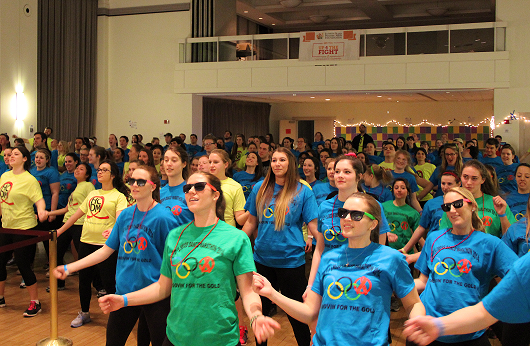 At Dance Marathon 2018, over 150 dancers participated for 12 hours, who together raised nearly $30,000! Join us and stand UP 4 THE FIGHT. This is one all-nighter you won’t regret! Follow HCDM's Facebook and Instagram for the latest updates!